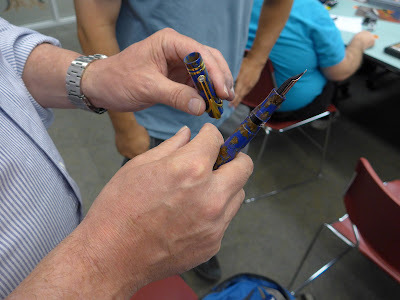 A grand total of 17 Vancouver Pen Club members (including newcomer Paul) showed up at the Oakridge branch of the Vancouver Public Library for our June meeting on the 14th. Alejandra's Sheaffer 'Cartridge Pen' (commonly referred to as their "School Pen"), which she acquired for a mere dollar. Her best bargain, though, is a Parker '51' set (not brought to this particular meeting, but we've seen it before) that she acquired for $50 at a local antique shop! 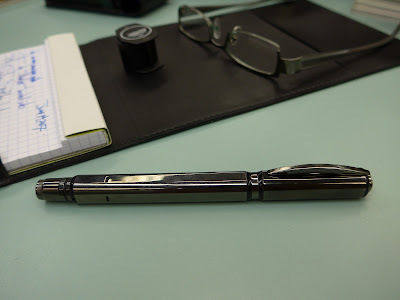 "Newest acquisitions" is always our secondary topic, and this brushed chrome Sheaffer Imperial (with a great factory italic nib) is one of Alejandra's newest purchases. 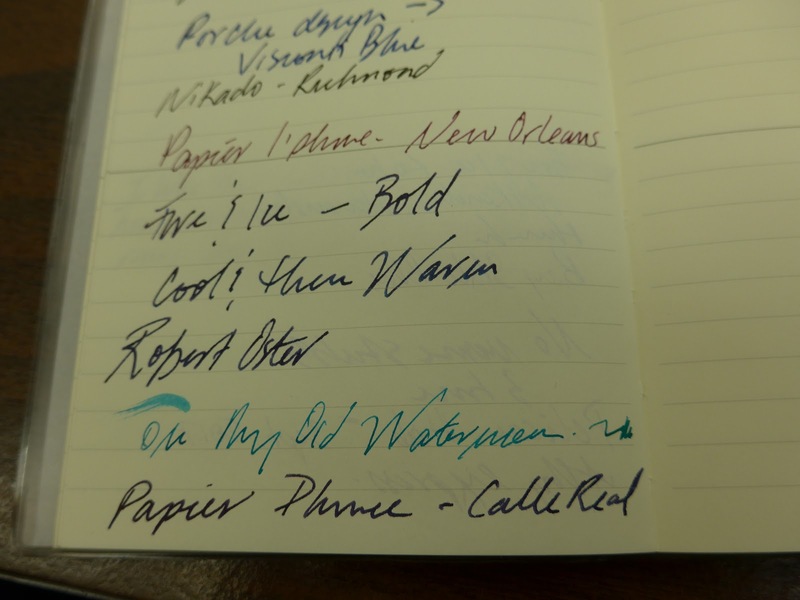 She also brought her new vintage Waterman 'Taperite' to show us (not pictured). Bruce always has some interesting fountain pens to show, and this Visconti 'Metropolis' is no exception. 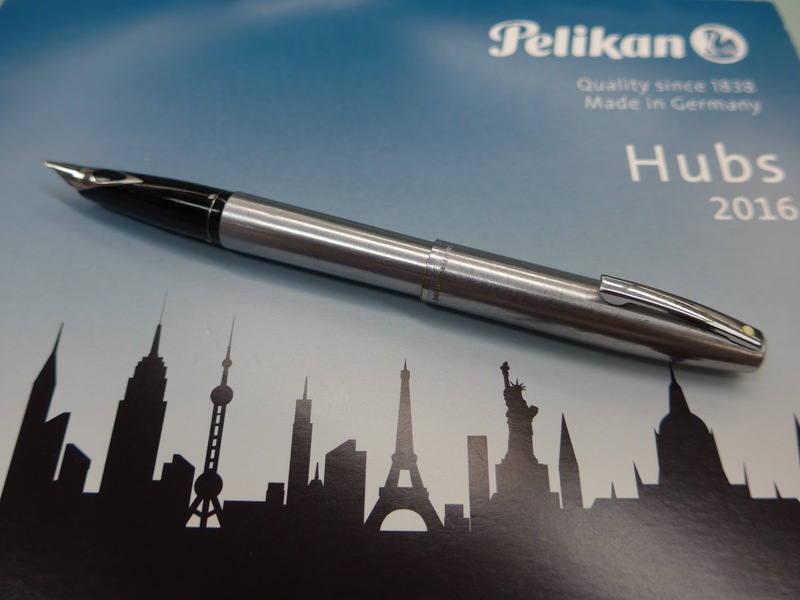 It's a piston-filling safety pen made of silver and coated with Ruthenium! 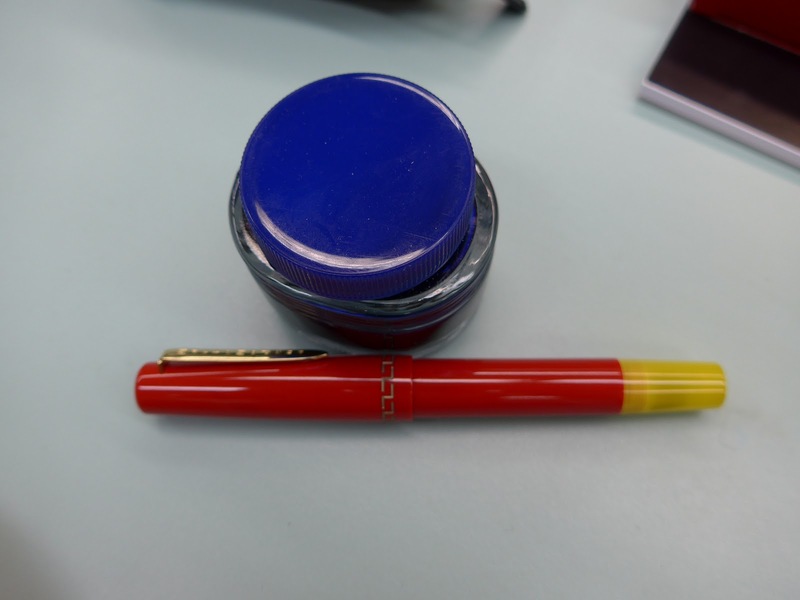 Bruce found this uncommon fountain pen on eBay for the bargain price of $160. 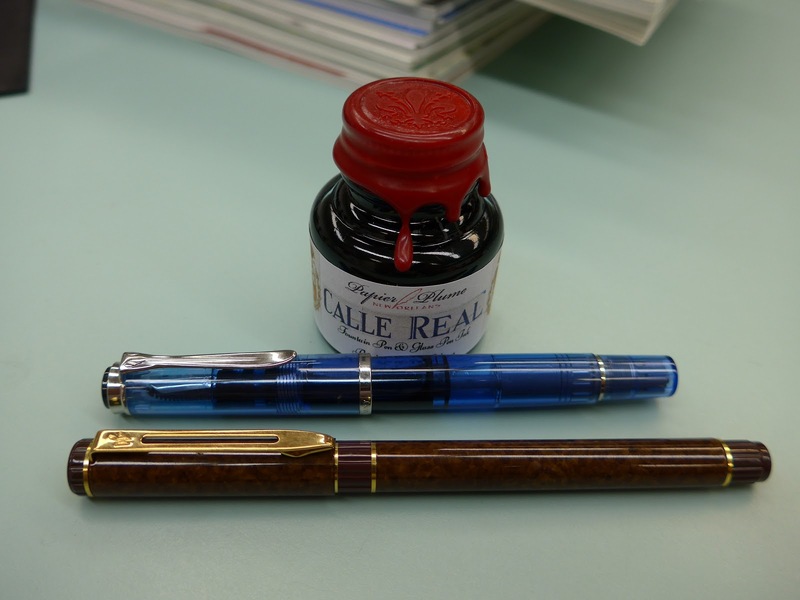 (Photo above) Paul also brought the fountain pen that got him hooked on our hobby---his TWSBI Diamond '580'. 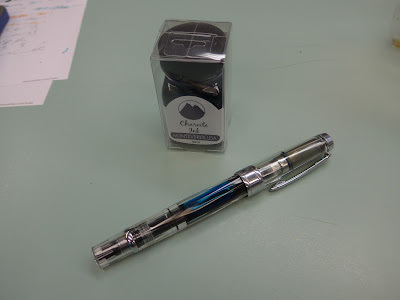 Above the TWSBI is the bottle of Monteverde ink that he won in our door prize draw, donated by Perks pen store in North Vancouver (at Lonsdale Quay). 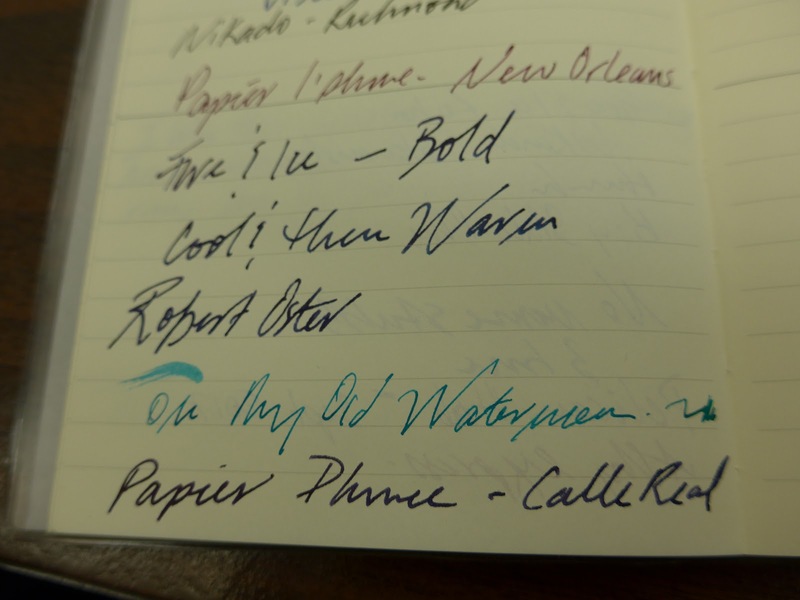 The ink comes in their new 30 mL size and is a lovely purple shade called 'Charoite'. 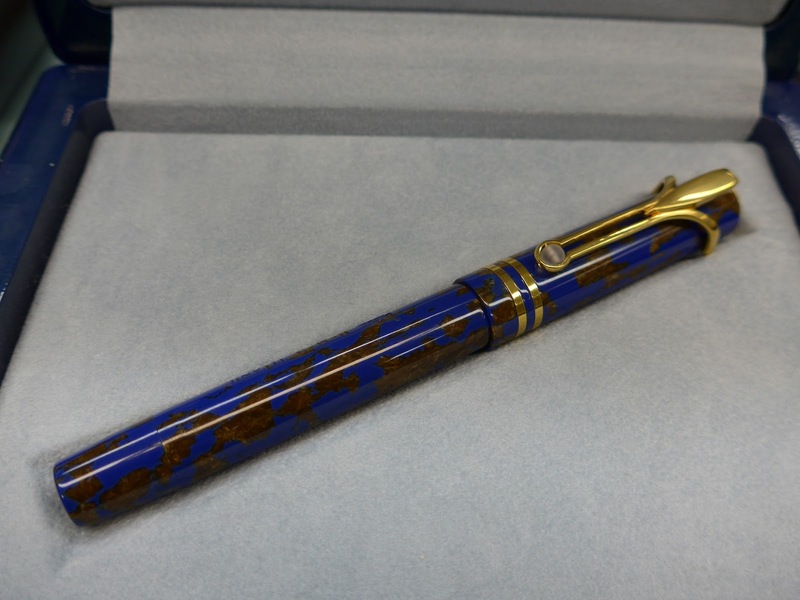 Speaking of elegant...Take a look at this gorgeous Lady Sheaffer in the "Damask" pattern that Stuart acquired for the bargain price of $60. 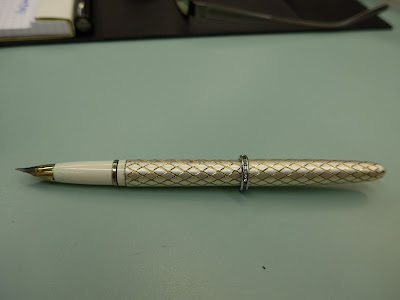 The barrel is vermeil (silver over gold) and has a decorative band of brilliants. 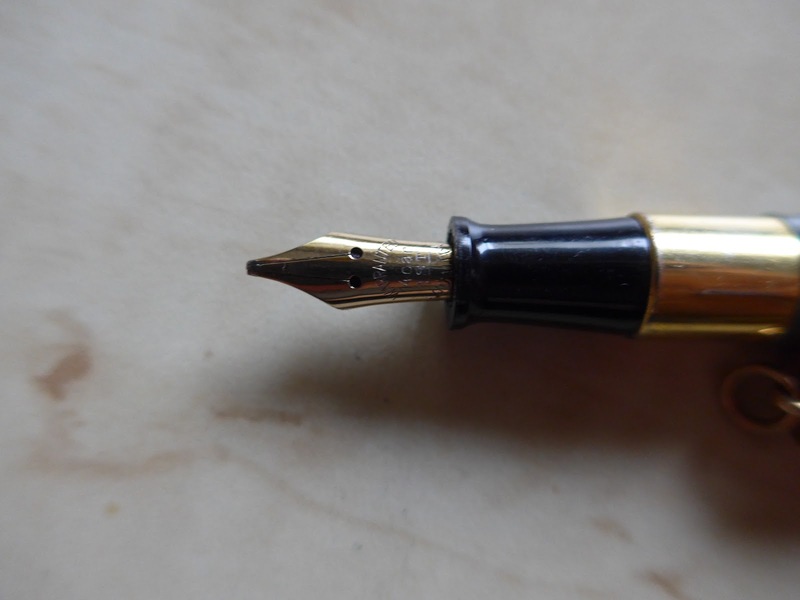 The pen is fitting with its original 14K gold Triumph (wraparound) nib, a wonderful Sheaffer design. 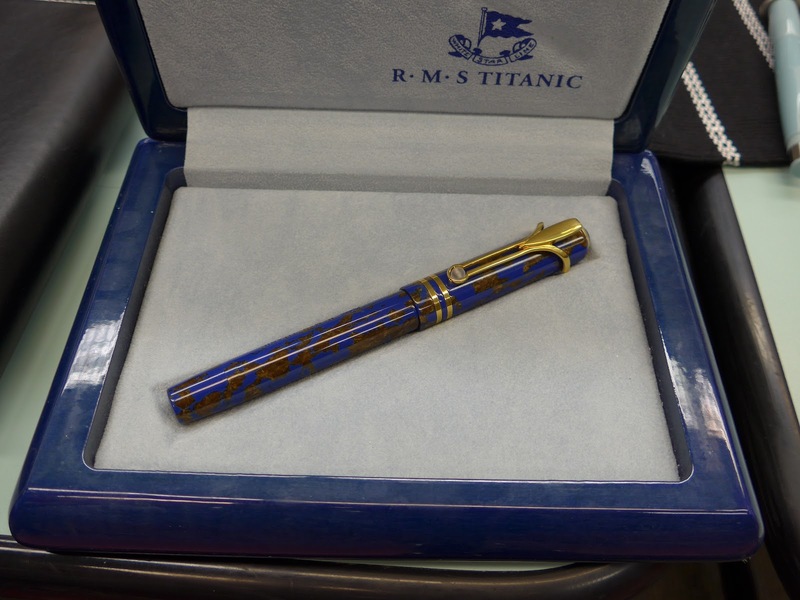 The pen originally retailed for $35 USD in 1959, which works out to about $280 USD in today's money! 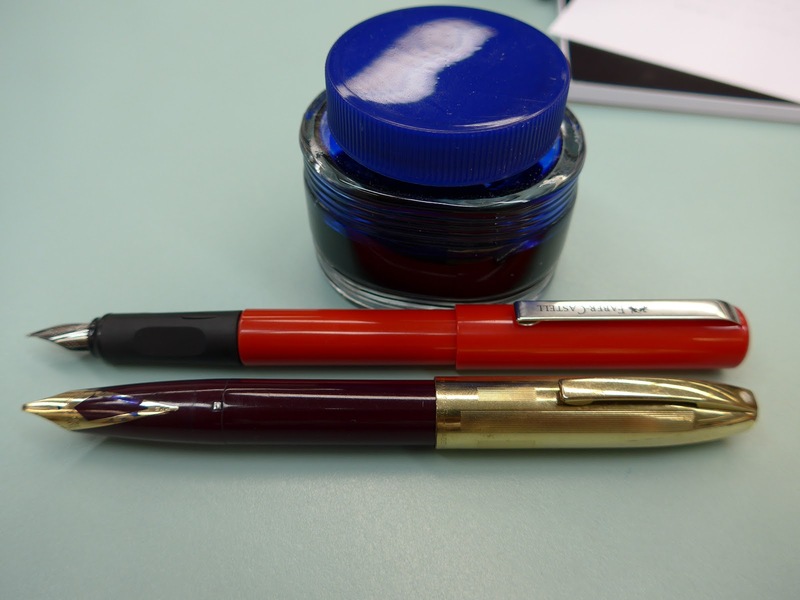 Another bargain that Stuart found online is this Sheaffer 'PFM' V in burgundy with gold-filled cap. 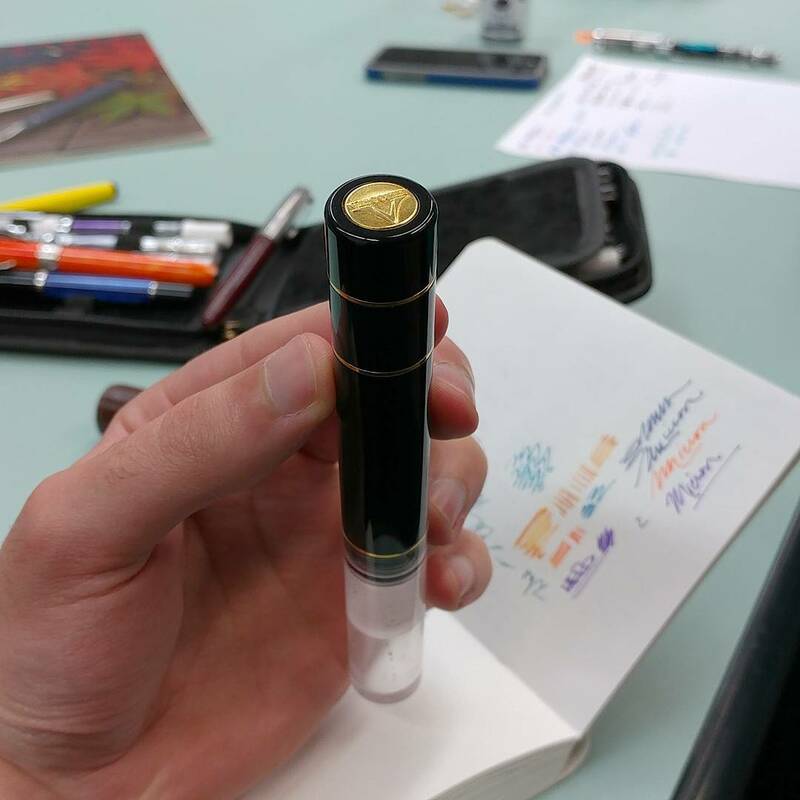 He paid a mere $50 for this highly-collectible vintage Sheaffer that comes with another wonderful Sheaffer nib---their inlaid nib. 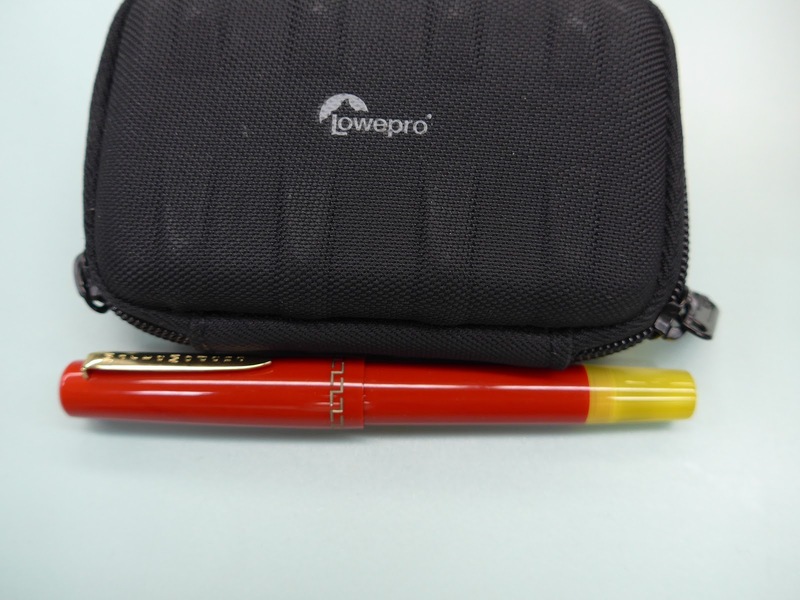 Above the PFM is a bright red 'School+' Faber-Castell fountain pen, a recent purchase. Not pictured---a vintage Eversharp 'Skyline' acquired for $20 by Stuart. Another new acquisition belonging to Stuart--a dark blue Borghini 'V40' fountain pen. The orange pen case is my own, an old purchase from a (now-closed, sadly) Campo Marzio store in Vancouver. Some quick photos of Alejandra's test drive of my new Robert Oster ink (in the "Fire & Ice" colour). 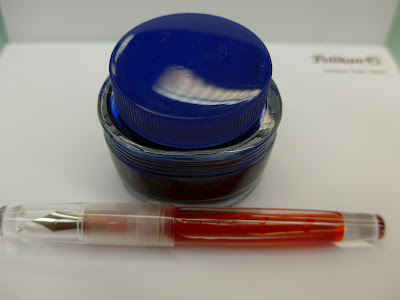 This is an intriguing fountain pen ink that can look either a turquoise blue/teal shade... or a darker red colour, depending on the pen used. If the fountain pen has a wet-writing nib, the ink will have a reddish sheen to it! 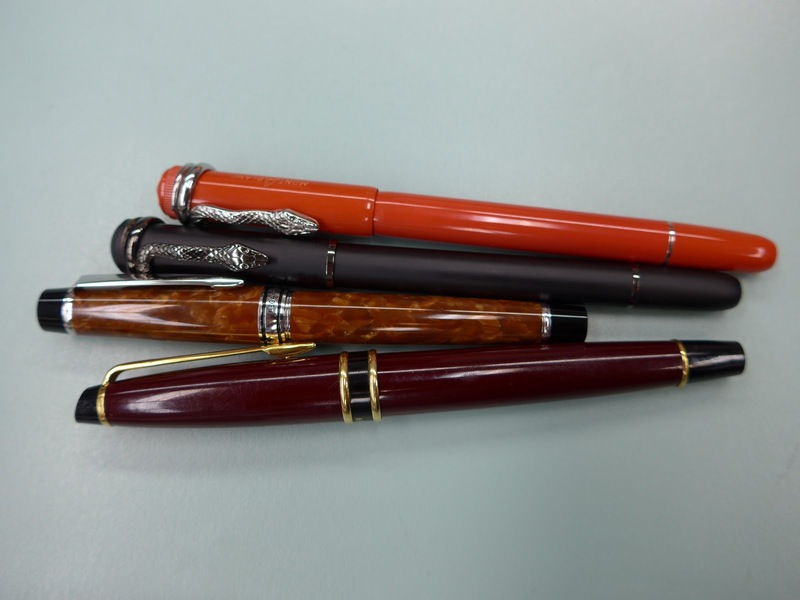 Peter's Parkers---a 1930's Parker Duofold in marbled red and another Parker (a '51'??). 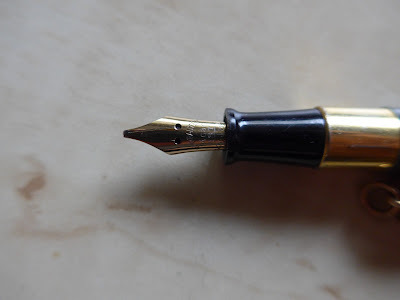 The Duofold was acquired in a trade for a modern fountain pen, a TWSBI. 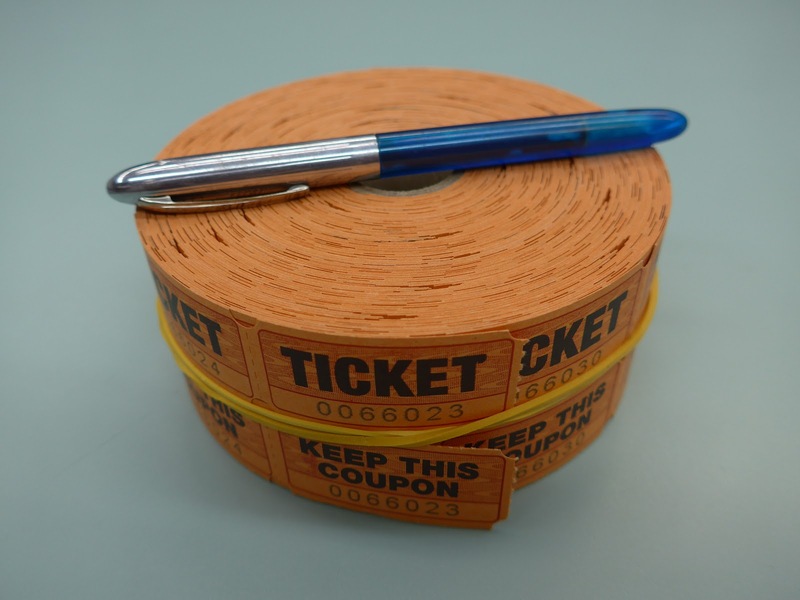 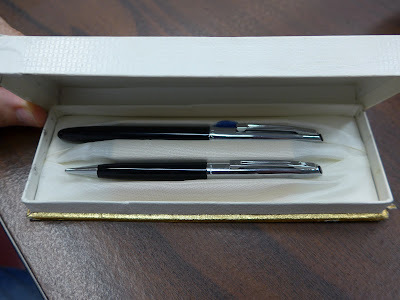 Peter's best bargain, however, is a pen he didn't bring to this meeting---a striped Parker 'Vacumatic' desk pen (a difficult-to-find vintage desk pen) that he acquired for the princely sum of $11! 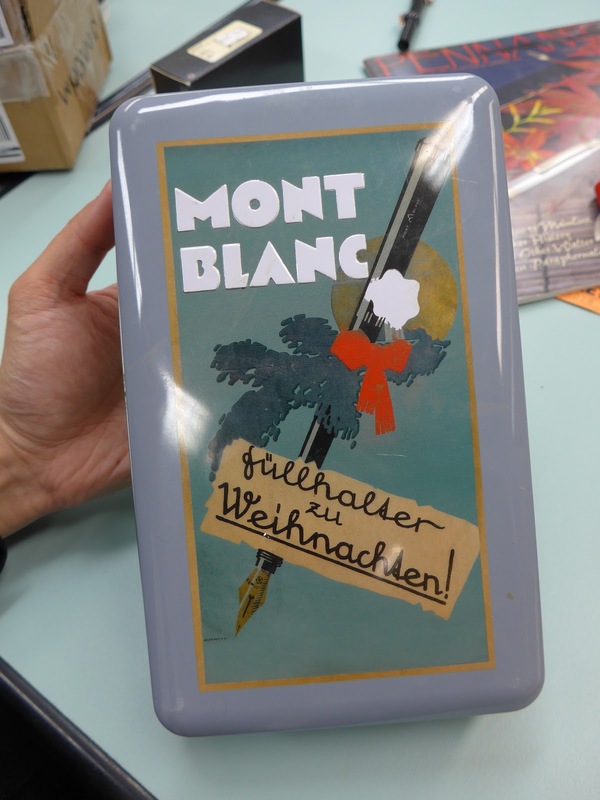 Here's something else you don't see every day---a Montblanc cookie tin! 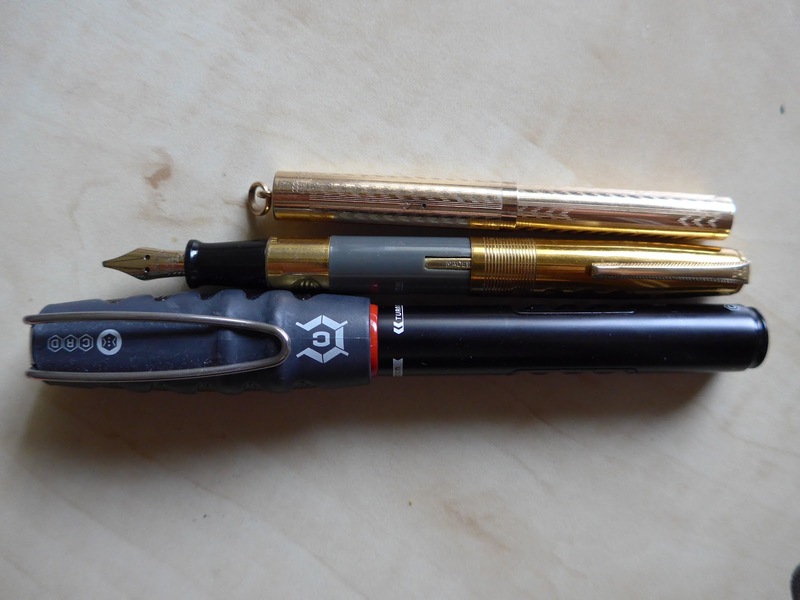 Mindy's newest acquisitions (top three pens) and a Waterman Expert that she got as a gift. 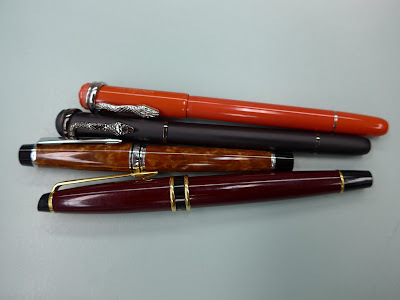 The pens with the cool snake clip are a tribute to Montblanc's "Heritage Collection" 'Rouge et Noir' Special Edition pens. Mindy also brought her authentic version of the coral pen (not pictured), which is a truly lovely fountain pen. 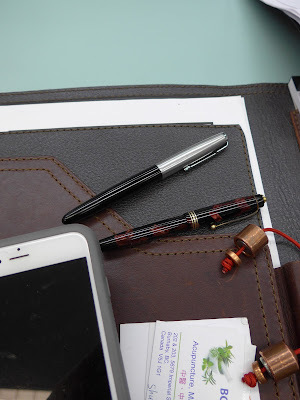 The brown (woodgrain) fountain pen is her new Pilot Legance Custom. 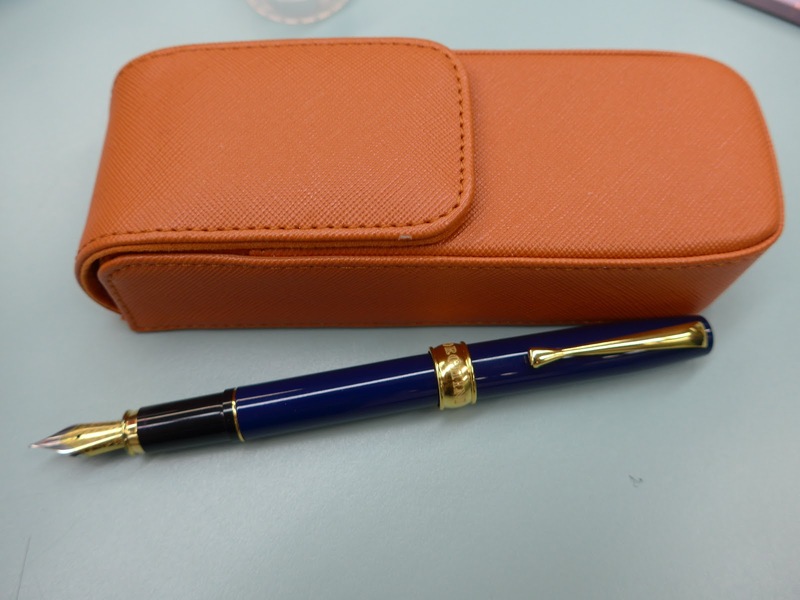 She didn't bring it to the meeting, but Mindy told us that her best bargain was a copper Esterbrook 'J' series fountain pen that her grandmother found for $5.00! (Below) A quick shot of the three "bargain" pens I (Maja) brought to the meeting---a 1920's gold-filled Wahl-Eversharp ringtop fountain pen and a black Rotring 'Core' that my Mom found in a thrift store for 10¢ and 25¢, respectively. I didn't photograph them (sorry, Bill! 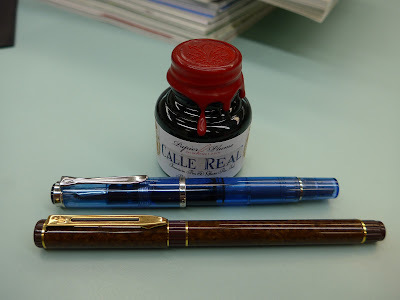 ), but one of our founding members brought a couple of really nice fountain pens that he received as gifts from a generous friend---a green-striped Pelikan M800 (I did photograph it at our March meeting here, though :) and a black-chased modern Conklin Crescent-Filler with rose gold-colour trim.